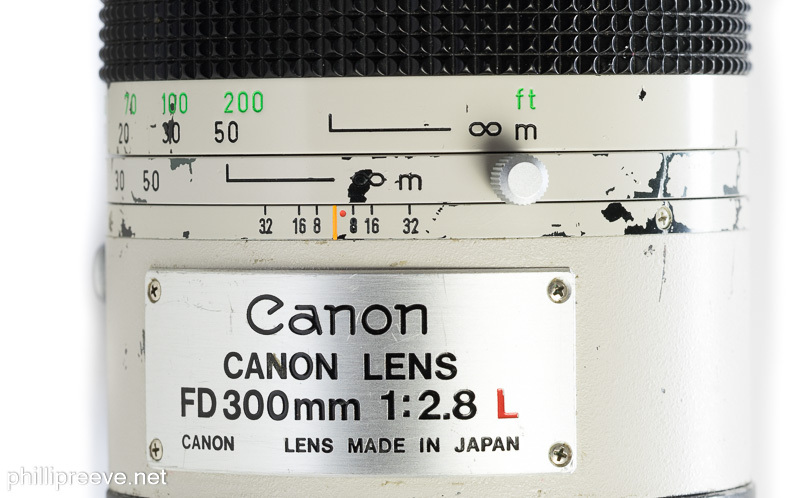 The Canon FD 2.8/300 L was one of the most highly regarded manual super tele lenses in the 80s. Today it can be had for much less money and in this review I evaluate how it performs today on a modern mirrorless camera. 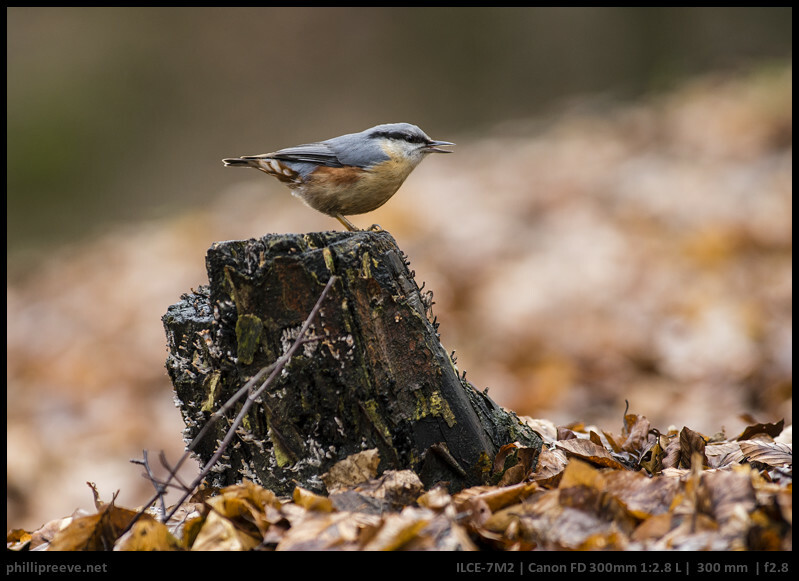 You can find all images shown in this image in full resolution in my Canon FD 300mm f/2.8 L flickr album. 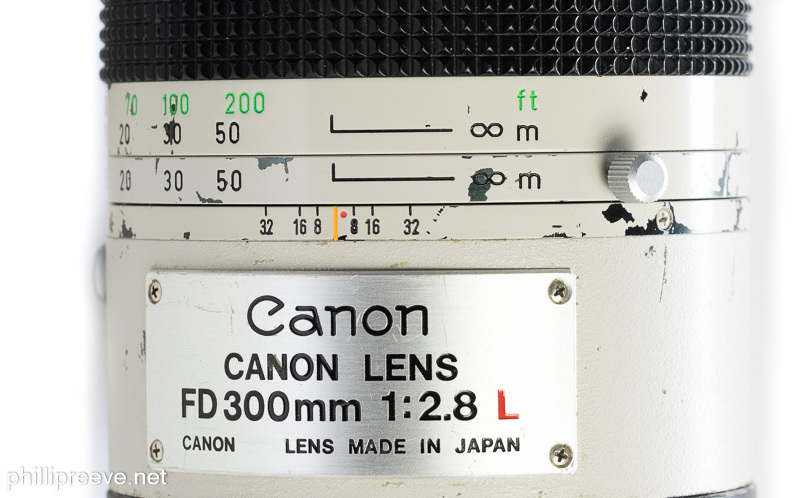 The Canon new FD 2.8/300 sells for around $750 at ebay.com, 700€ at ebay.de (affiliate links) if you have some patience and find an auction. It costs more if you buy it for a fixed price from a retailer. I am aware of two versions. 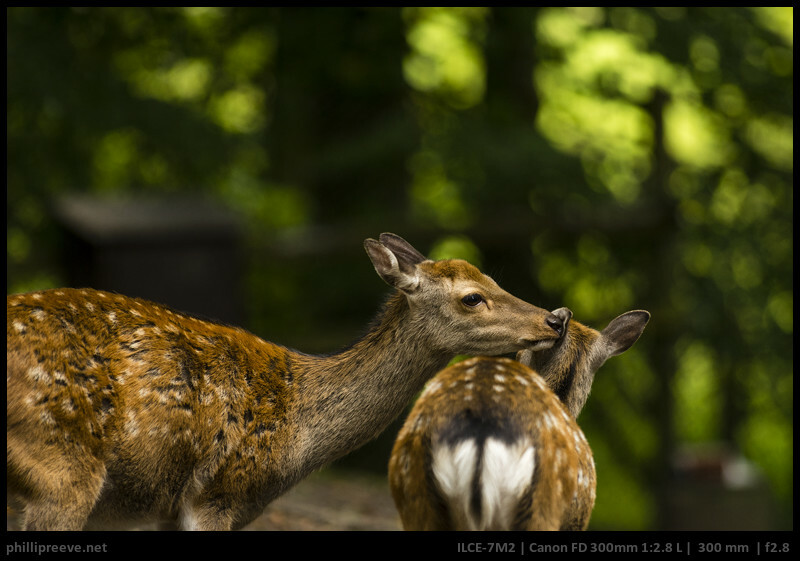 The Canon FD 300mm f/2.8 S.S.C. Fluorite was released in 1975. It is black, weights 1900g, focuses to 3.5m and uses the older breech lock. 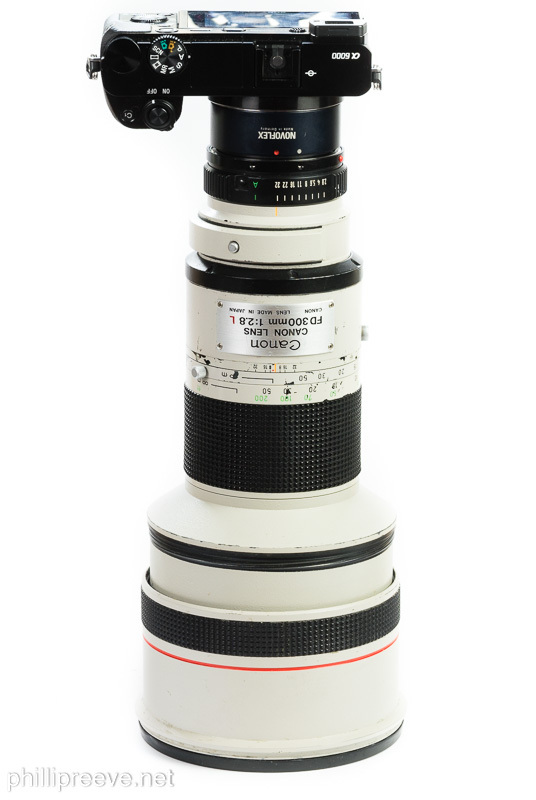 The Canon New FD 300mm f/2.8L followed in 1981. It is white, weights 2348g (my measurement with filter, Canon specifies 2310g), focuses to 3m and has the new FD mounting mechanism. This is the version discussed in this review. I have no reliable information on the performance of the older version but since it uses only one fluorite element I would expect more CA from it. 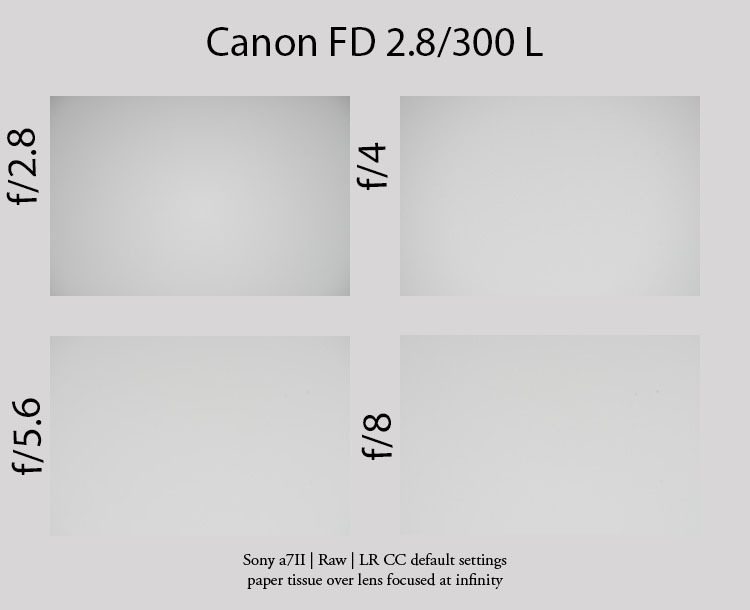 The Canon FD 2.8/300 is a fully manual lens so you have to change focus and aperture by yourself and you have to use an adapter to use it on a mirrorless camera. The Canon has an adjustable infinity stop which is easy to change and works well. The lens also has a slot for 48mm screw in filters in the back. 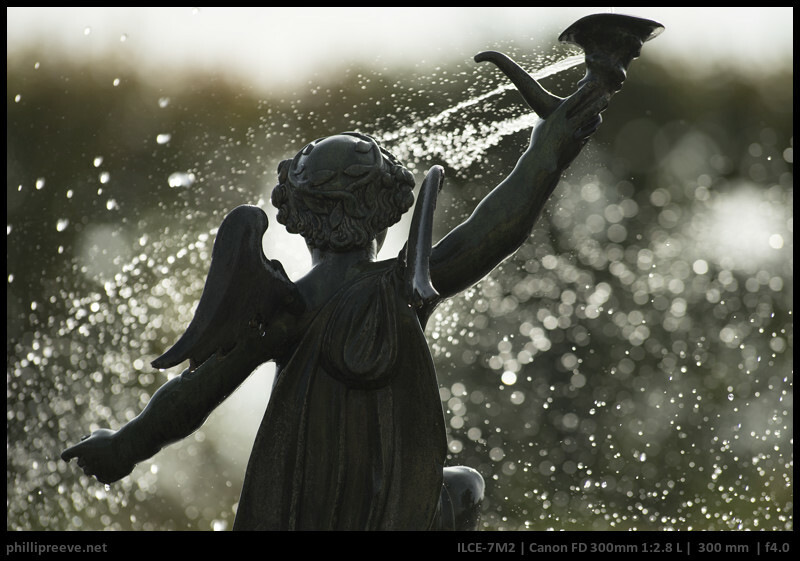 The Canon has an unusual mechanism to change it from landscape to portrait orientation. With the press a silver button at the left side of the lens you can rotate the whole back of the lens and with it the camera by 90 degrees. The Canon also focuses internally which means that it does not extend and that it is much easier to focus quickly with it. 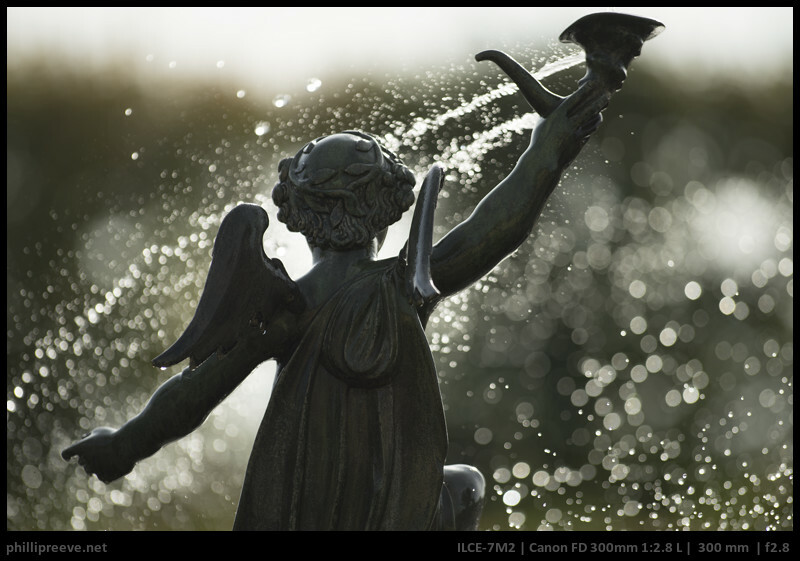 The Canon FD 2.8/300 offers excellent build quality. This lens was made to withstand professional abuse for many years and it is up to the task. The focus ring travels around 260 degrees from 3m to infinity. Resistance is very low which makes sense because it makes tracking manually easier. It makes focusing the lens very precisely more difficult though. 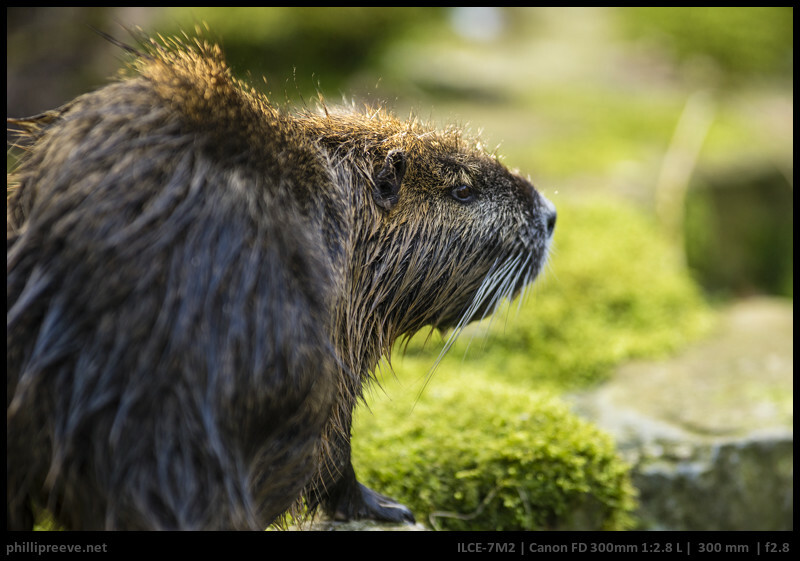 In my experience it wasn’t too hard to follow a subject manually with the Canon 2.8/300 because the focus ring offered so little resistance and because subjects jump into focus thanks to the very large aperture and good performance. The aperture ring is a solid one. It is made from metal with distinctive enough stops and a very pleasant resistance. 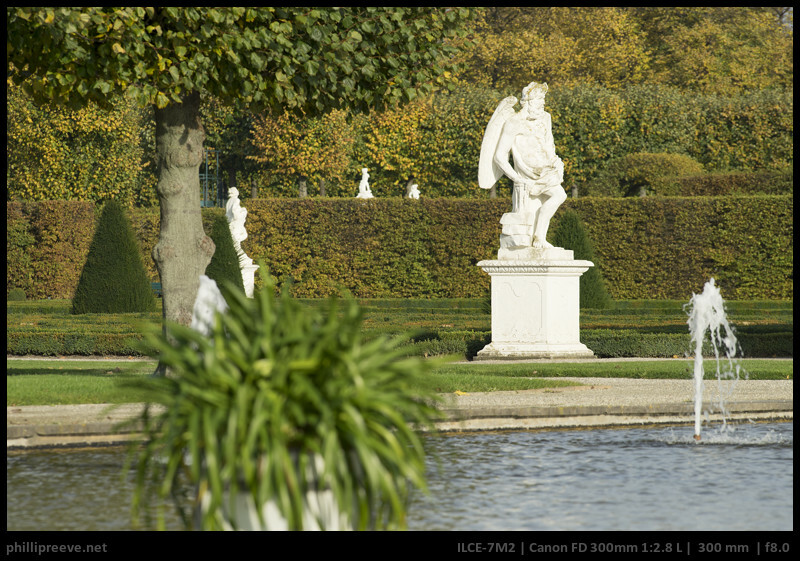 It works in half-stops from f/2.8 to f/32. Oh boy. The Canon comes with a very solid integrated hood which it about 3cm deep. It locks into place very reliably and it’s rubber coated at the front so that I don’t hesitate to put the whole lens on it. The integrated hood does little to protect the giant 100mm diameter front lens. For that it comes with a very big 110 mm long hood (Model EH-123) which turns this lens into an gigantic monster but it actually helps to keep contrast high in backlit scenarios. This is a very big an heavy 5 pounds lens. You won’t enjoy carrying it, nor hand-holding it. I had to borrow a stronger tripod head from Bastian to perform my test because it is so heavy. You can handhold and focus it from your hand especially with activated image stabilizer on the Sony a7(r)ii but unless you are a really strong guy your arm will quickly tire. 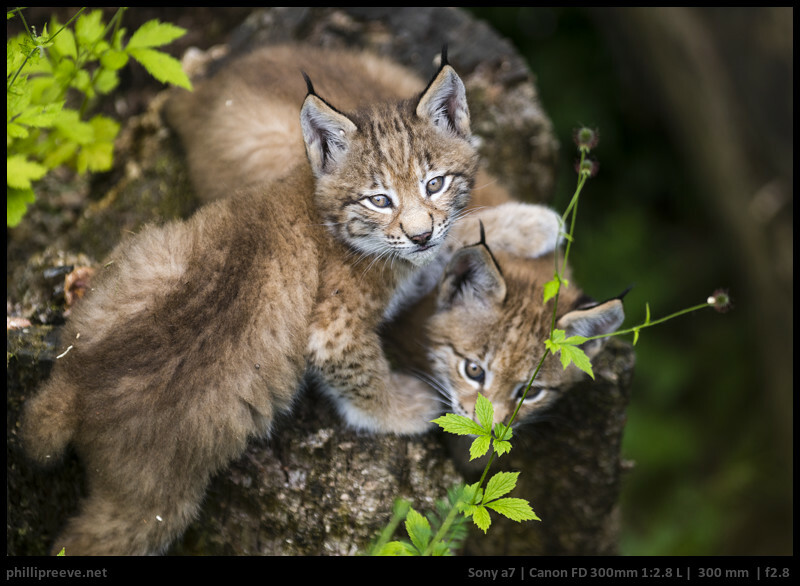 These results are based on the use with a Sony Alpha 7II. Flare is an issue with this lens. I forgot to keep any of the images I lost to it but there were quite a few of them and if you manage I can only recommend to use the hood. Now let’s have a deeper look. Up close the background is super smooth and just melts away. The same is true in the typical headshot scenario where the subject is totally isolated from the background which is rendered very smooth. Oof highlights take on a cat-eye shape wide open but the effect isn’t pronounced and there is only very little bokeh fringing. Also note that even stopped down there blur discs stay mostly round thanks to 9 aperture blades. Background rendering deteriorates a little in this upper body shot with a close background but it is still mostly smooth. 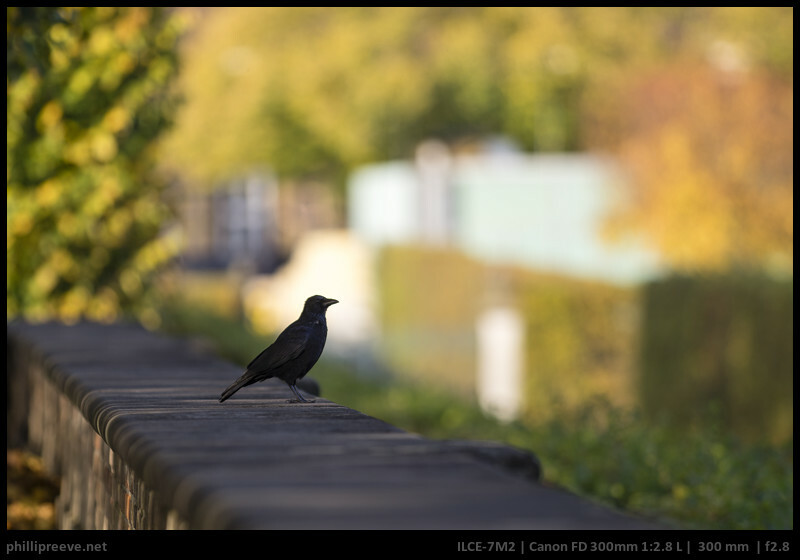 This test scene at a long distance with a close background shows average foreground bokeh and less smooth background bokeh. The transition zone is decent but not great. So bokeh isn’t perfect but pretty smooth and it is really easy to throw backgrounds out of focus with this lens. The Canon’s suppression of any kind of CA is impressive. 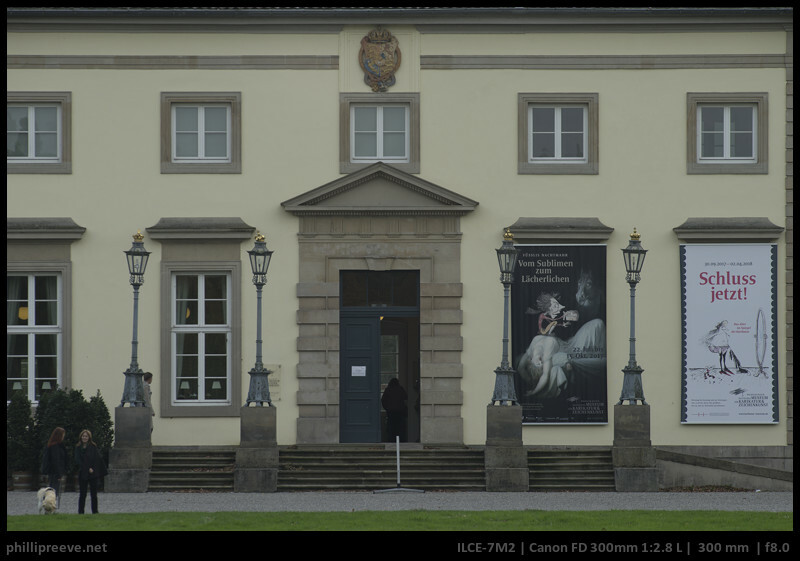 I have only seen such great performance in this aspect by the 30-years-younger Voigtländer 2/65 APO. Even my worst case torture test failed to show more than traces of axial CA. With a less well corrected lens you would see a blue halo around the bird, not so with the Canon. Lateral CA is low but visible in critical cenarios. 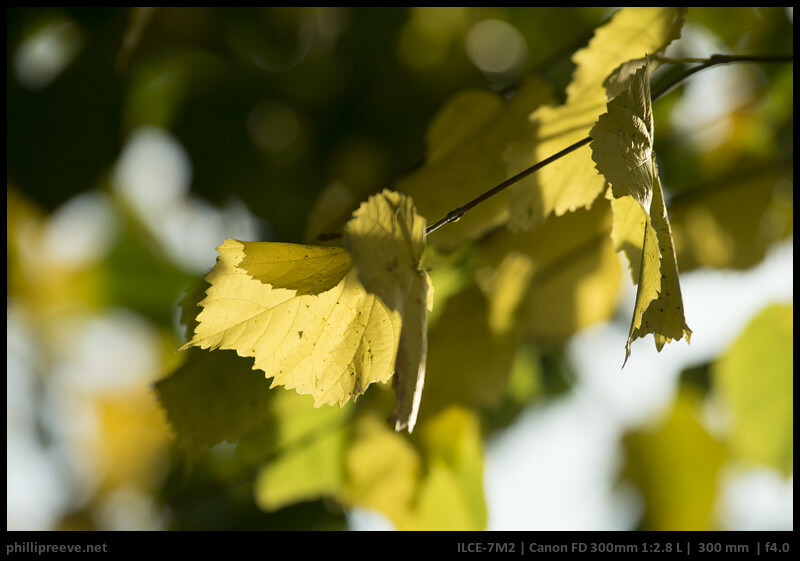 Vignetting at f/2.8 is low at 0.8 stops and basically unnoticeable from f/4 at 0.3 stops. Very good performance here. 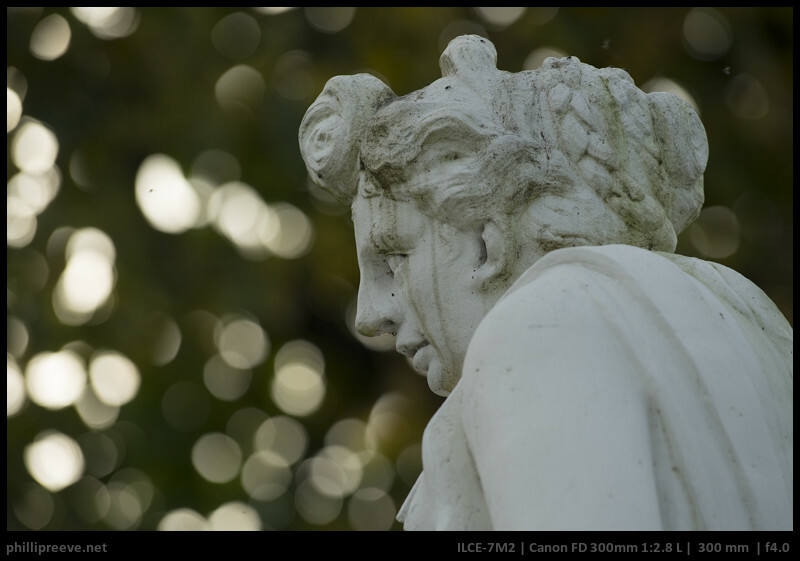 The Canon FD 300mm 1:2.8 shows minor pincushion distortion. My sharpness series isn’t optimal but after my first attempt failed because my tripod wasn’t up to the task, the second one had issues with flare and alignment this is the best I could come up with in pretty hazy conditions. 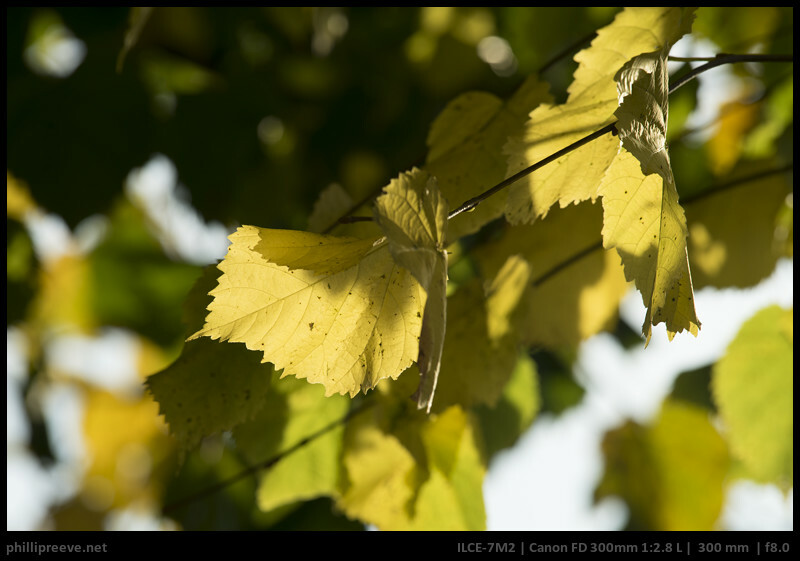 The Canon is very sharp in the center and midframe from f/2.8 but it gains a some contrast and sharpness as you stop down to f/4. Corners are good from wide open but for best results you should stop down to f/8. 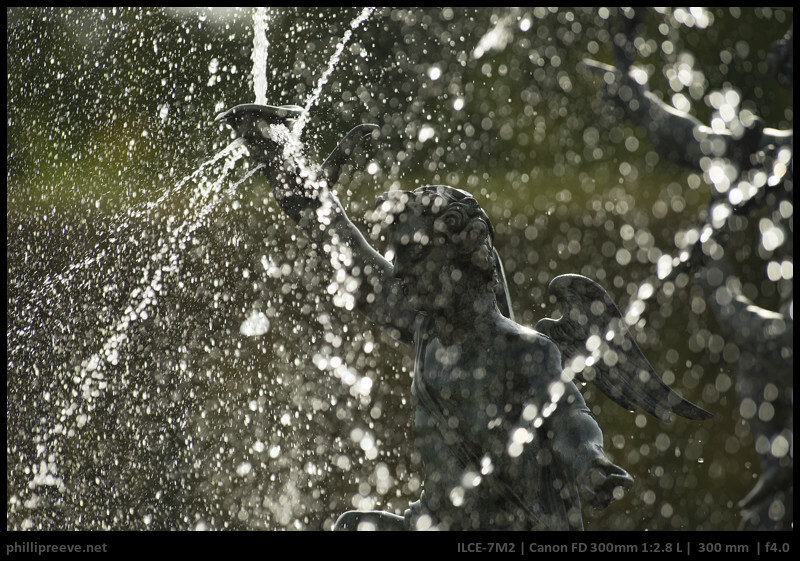 Contrast is rather average, I have often bumped it up a bit in processing for images taken with the FD 2.8/300. Nikon ED-IF 2.8/300: I have not shot a direct comparison but from what I have seen and read it seems to me that the Nikon is very similar in that it is very durable and it also features internal focus for fast manual focus but it only focuses down to 4m. Optically It seems to be not as well corrected for CA as the Canon but it is still a very sharp lens with very good bokeh. 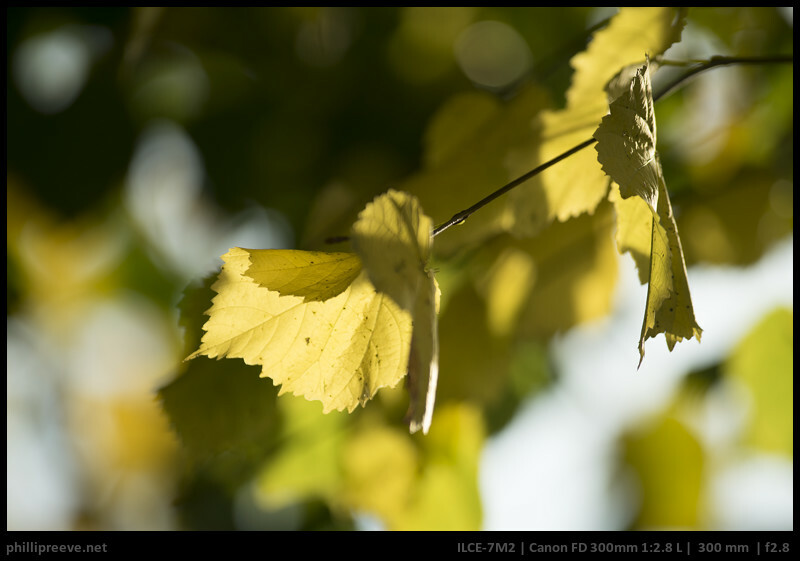 So if you want a 2.8/300 for your mirrorless camera the Canon seems to be quite a bit more attractive to me. 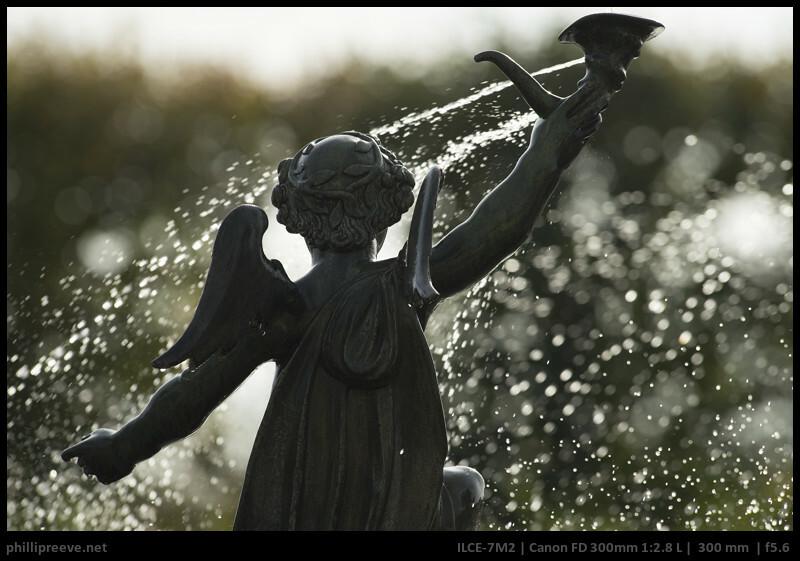 Canon FD 4/300 L: A much more reasonable lens which weights and costs less than half as much as the big f/2.8. I shot a few comparisons and I have to say that the difference f/2.8 makes over f/4 is bigger than I had thought. The f/2.8 version also has a little longer focal length and superior CA correction. Sharpness is very similar. So the f/2.8 gave me nicer images but I really had to think twice about bringing it with me while the 4/300 can fit into my larger camera bag and it is much less tiring to operate. 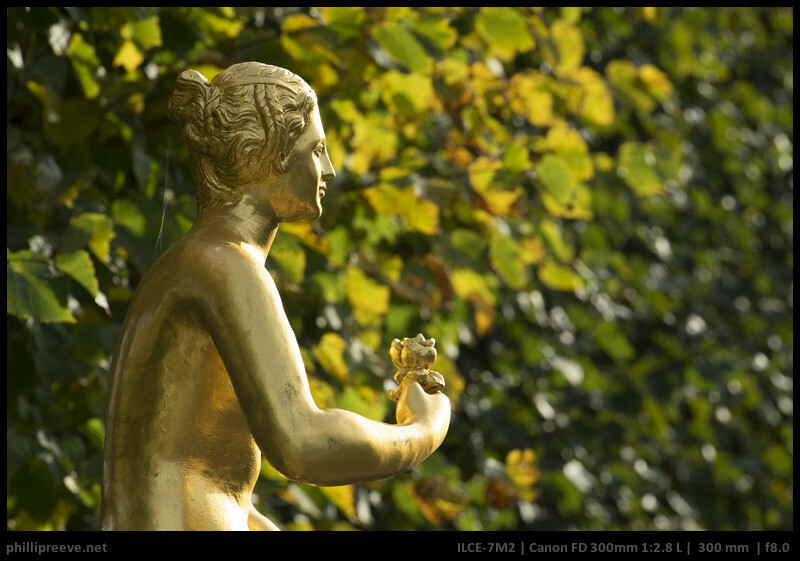 The Canon FD 300mm f/2.8 L is the best corrected legacy lens I have used so far. Sharpness is very good from wide open and excellent from f/4, there is practically not distortion and vignetting is low as well. What impressed me the most is the excellent CA correction which even today, 36 years after the Canon’s release is not standard. Only flare can be an issue but that is the be expected with such a large front lens. So while I was very happy with the optical performance, the handling turned out to be a challenge. Not because the Canon’s design, it is very well designed, but because it was a challenge for me to transport this 2.3k lens to location. Usually I travel by bike and since it doesn’t fit into any of my bags I had to transport it in a backpack and it takes me about a minute to get it out of that and onto my camera. It’s little brother in contrast fits into my bigger bag and is easier to operate. 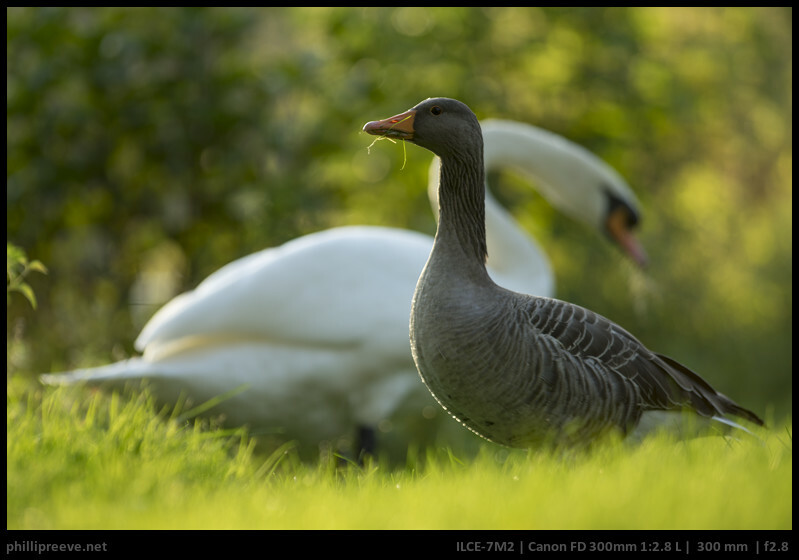 But once it was attached to my camera I was always very happy with the results, the wide aperture really makes a difference and the very good performance and smooth bokeh made images stand out. So how much sense does a manual 2.8/300mm lens make in 2017? 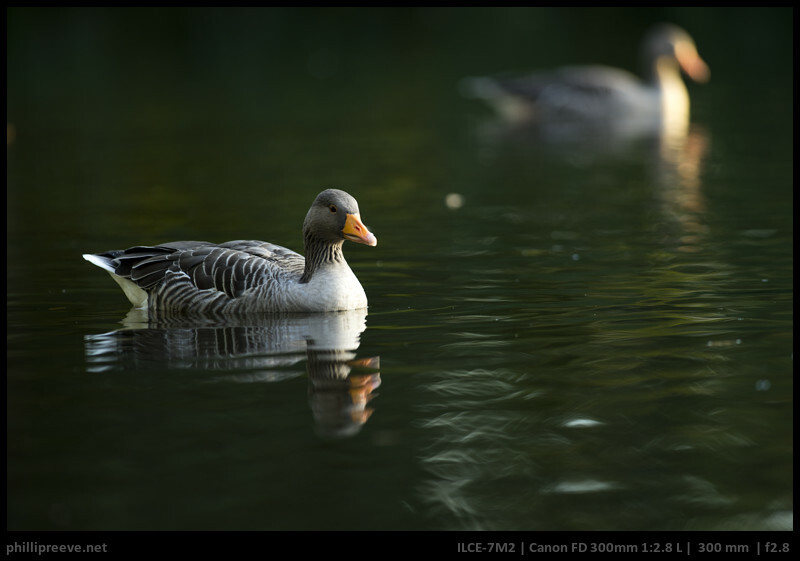 Manual focus is of course a limitation and it makes very little sense to shoot birds in flight or other demanding scenarios with this lens because your success rate will be much lower than with a good AF 2.8/300 lens on a faster camera than my a7ii. Such a setup would cost many times as much though. For someone who occasionally needs a fast 300 for zoo pictures, for portraits or for reportage work and who has decent manual focus skills this lens will deliver results which stand out from those of slower (AF-) lenses. 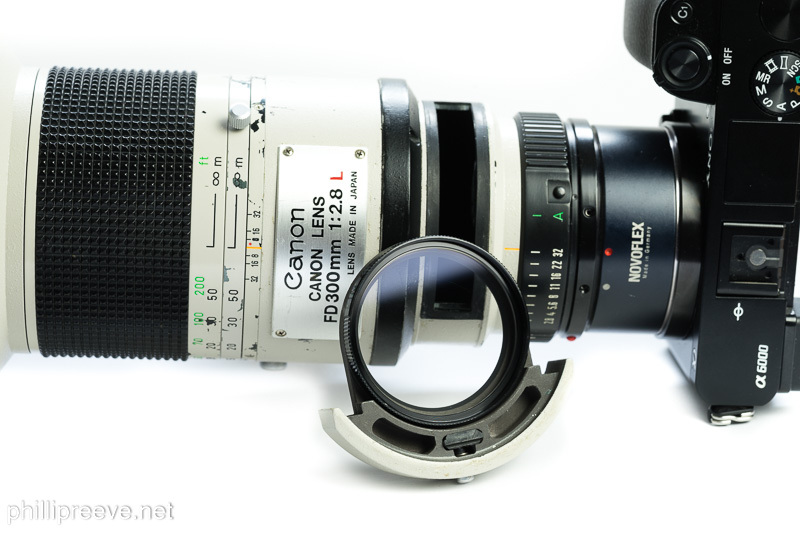 The Canon FD 2.8/300 L is an outstanding lens optically and can be bought for less than a grand. So you get a lot of glass for your money. The important question is if you can handle the glass but my answer is that for some applications it still performs very well today. 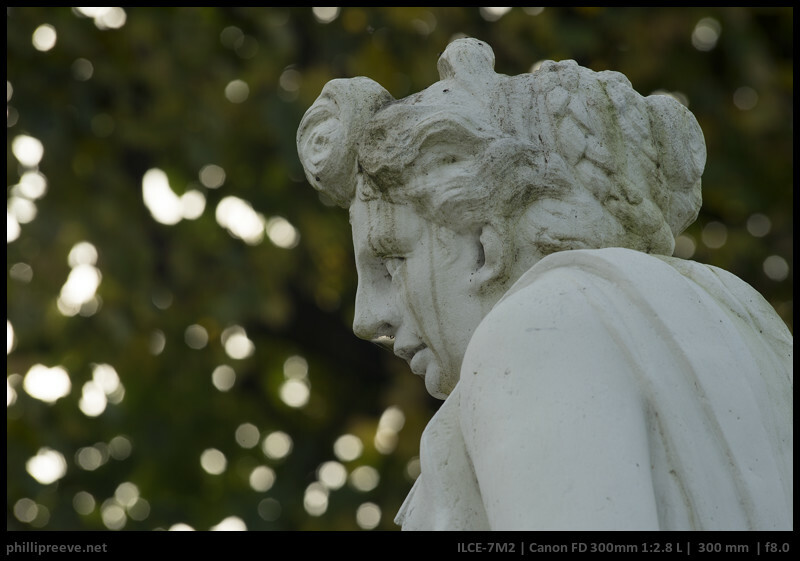 You can find these more images in full resolution in this flickr set: Canon FD 300mm f/2.8 L.
$700 is about the price you would have to pay in an auction for a copy in decent condition. Since they don’t sell often prices vary quite a bit though. As always, excellent review Phillip. Thanks much. You feel this lens is better corrected than the Minolta 200 2.8? I agree with the other commenter about prices. There are 11 of these on ebay right and the lowest price including shipping is $980. Highest is $2,200. Average is probably about $1,200. $700 seems unlikely unless you’re extremely patient and look every day for many months. But even at $1,200 I think this is still a stellar lens. If you get one for $700 you’ve damn near committed burglary. It’s way way better than the Nikon AI-S 300 2.8, which can be had for around $700, or the Tamron SP 300 2.8 (60B), which can be had for around $500. My prices are the average of the last auctions for decent condition lenses. “Buy it now” is of course much more expensive but if you are impatient and have the money it might make sense to pay a little more. When I sell my copy soon it will be for close to 700€. I agree, I think it’s worth the prices it’s going for. It’s a much better lens than anything the competition was offering at the time. 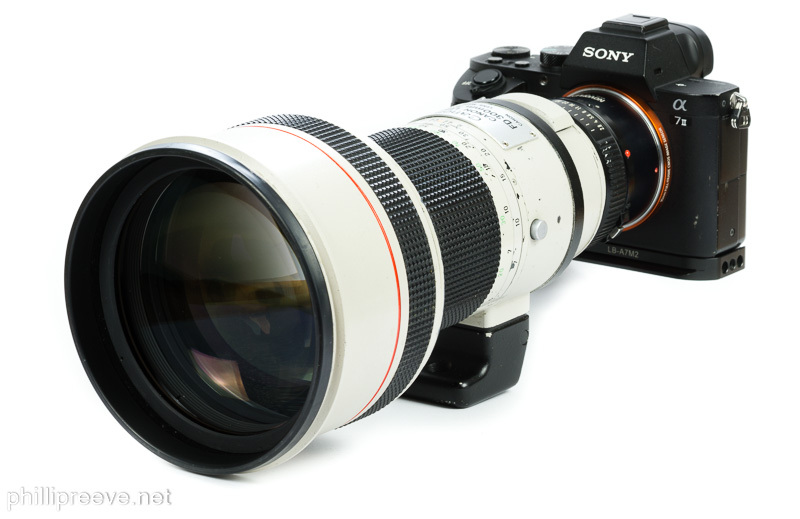 If I were in the market for a fast 300mm lens, this is the one I would buy. Its nice to see you looking at longer lenses. 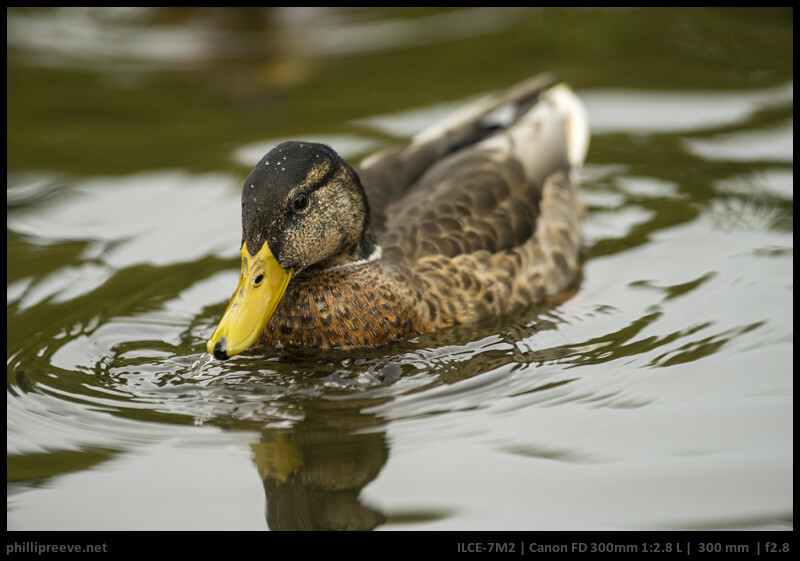 I am somewhat new to photography but have been an outdoorsman since childhood. I would love to combine the two and do some photo hunting off season. 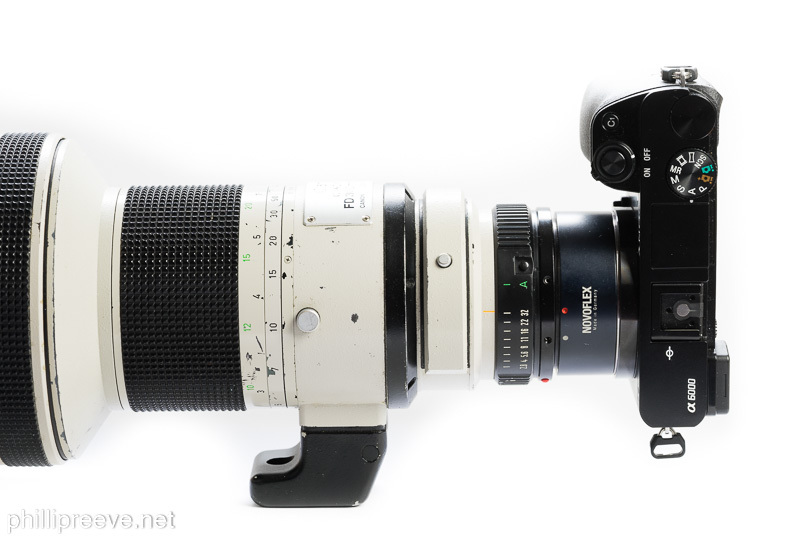 So far I’ve spent sub $100 on both an OM300mm f4.5 manual focus and a sigma 400mm f5.6 AF (was given an laea4 when my father in law dropped using his old Minolta lenses). Neither one is very good, I do Ok with the OM on items not moving and the sigma has a lot of haze but does OK with AF with larger items such as deer and struggles even with slower soaring birds in flight. I have yet to get great images out of either of them. I’m at the point of wanting to spend decent $$$ to get something good but can’t justify the new sony 100-400 lens. I’m pretty sure I want AF for this type of photography. do you have suggestions for something in the middle price wise? Hi Phillip, I am a newbie and living the dream with a Canon F-1 and a host of FD Lenses. I am about to order the Sony A7II. I have been reading your articles regularly and do appreciate your wisdom and support you provide to your readers. I am a convert and on your frequency! I am keeping an eye out for the 300mmf/2.8L. I will let you know when I have it in my hands, together with my A7II. 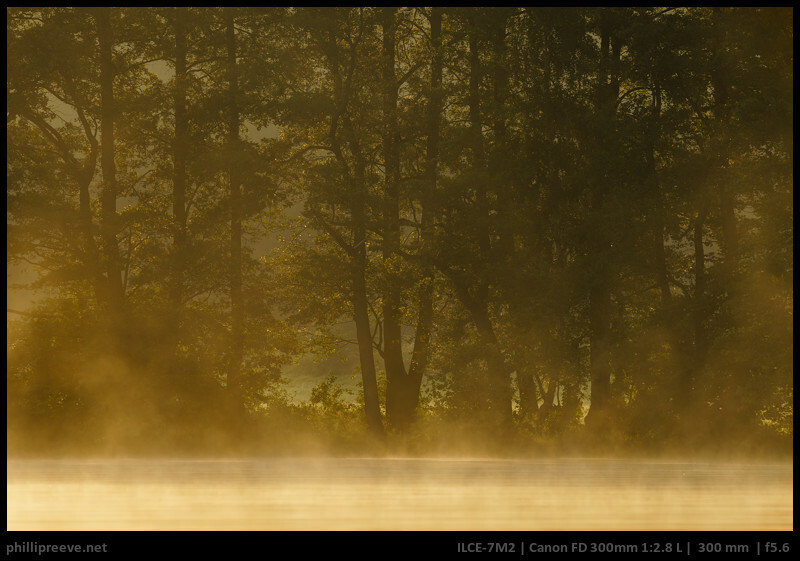 Again, I cannot thank you enough for opening my eyes, literally, to the world of FF photography. Interestingly, when you blink you miss out on what surrounds you. A7II, and I don’t care so much for absolute perfection, I would care more for good range, good enough quality durability and fast AF. I’ve read good things about the sigma 150-600 but they don’t offer in A or E-mount. Sad part is this weekend there was a juvenile bald eagle by my house and I was able to get pics when it was up in a tree about 25 meters away but the quality is just poor with the sigma I have. 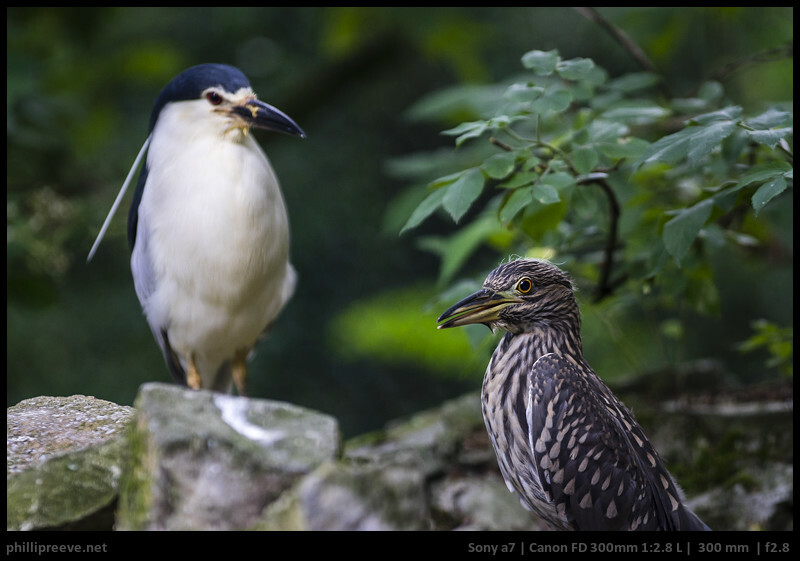 Your biggest issue will be the a7ii which does not have very fast AF, so even with a native GM 100-400 you won’t be able to capture birds in flight with a good success rate. 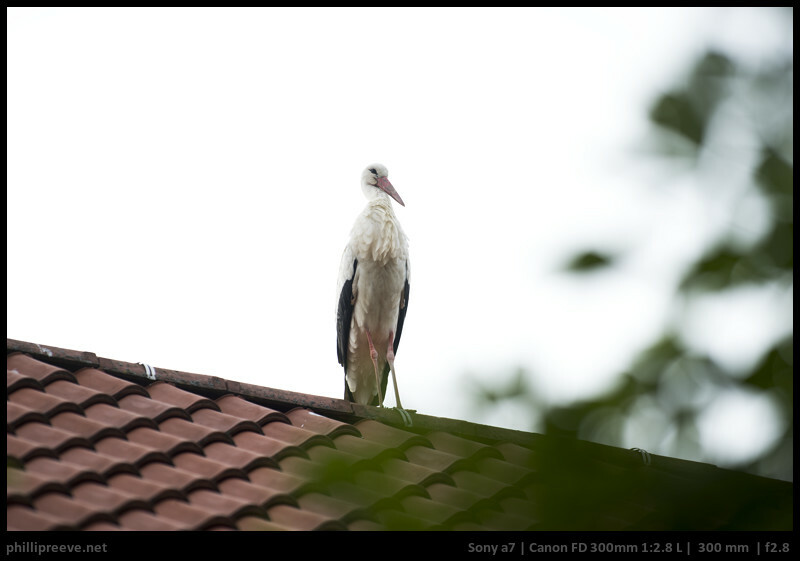 A cheap DSLR like a Nikon D7100 with a Nikon 5.6/200-500 would probably be a better solution here. 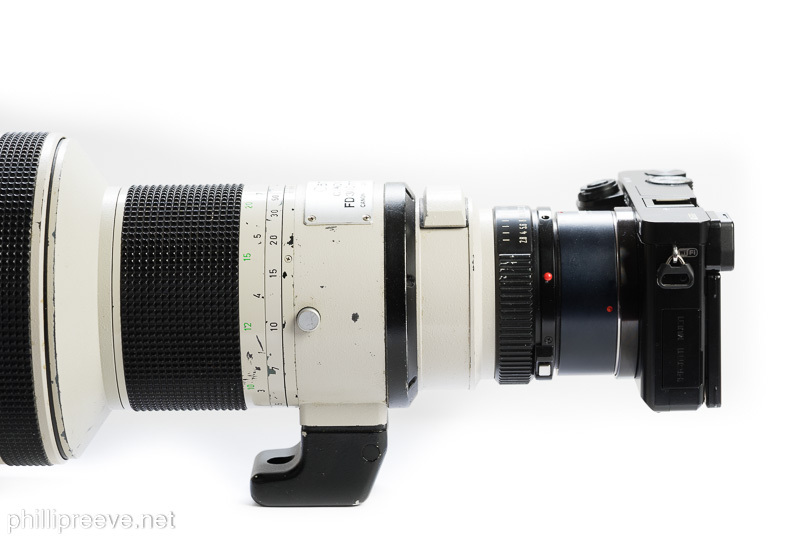 I have the Canon FD 500mm f4.5L, also containing UD and fluorite elements, and it is equally superb and I picked up my copy in very good condition with original aluminium flight case and hood extension for £650. 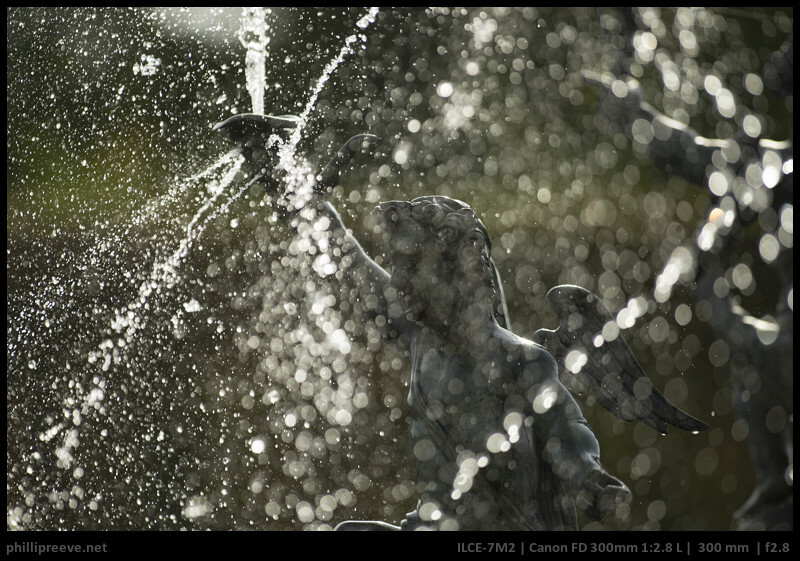 It retains good sharpness with the Canon FD 1.4x Extender as well. 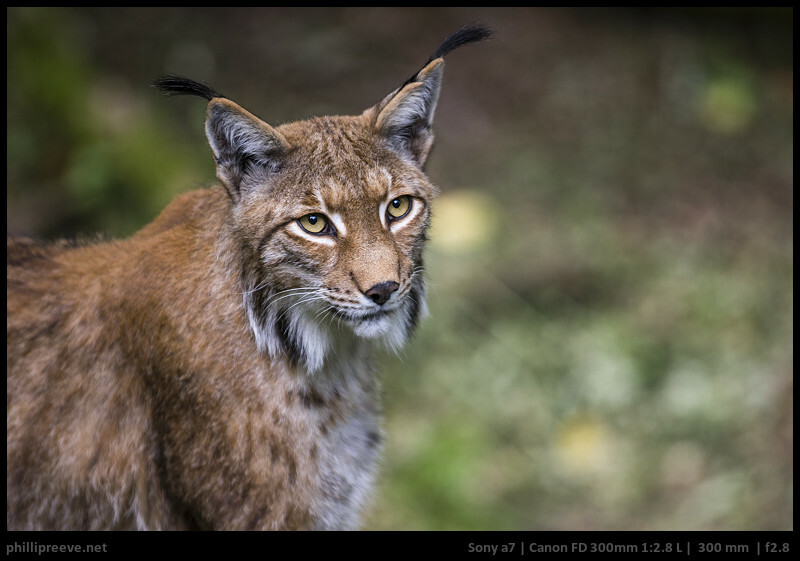 The best legacy nature lens I have used so far (compared to Canon FD 300mm f4L, Tamron SP 300mm f2.8, Tokina AT-X SD 300mm f2.8, Tamron SP 400mm f4 and Sigma 500mm f4.5 APO). How would you say that those long lenses compare to the FD 2.8/300 L? The Tamron and Tokina 300 2.8 lenses show a lot more purple fringing than any of the Canon FD lenses with Fluorite elements. 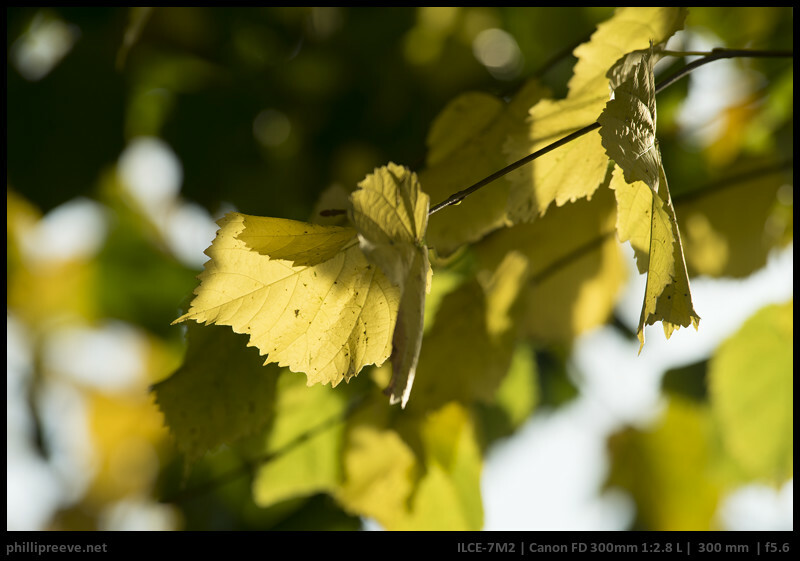 I haven’t yet used a 300 2.8L, but from your comments it is exactly what I would expect from fluorite. I found both the Tamron and the Tokina sharp wide open and the build quality of the Tokina lens is astonishing, it felt as if it would survive a nuclear war. Incredibly heavy though. 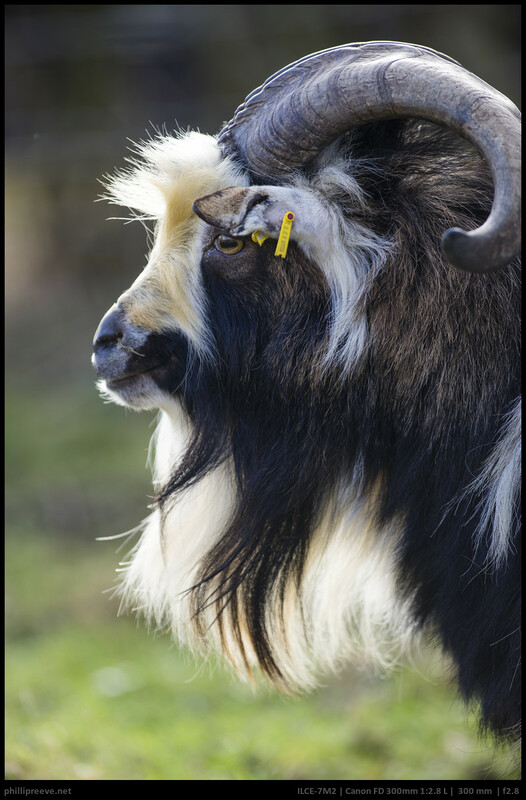 The SP 400mm f4 was a wonderful lens, very sharp wide open and stopped down it was razor sharp. However, purple fringing again an issue, two LD elements, but nothing beats the Canon fluorite. The Sigma 500 I didn’t use enough to really tell – I managed to snap up the Canon 500 4.5L and didn’t look back. 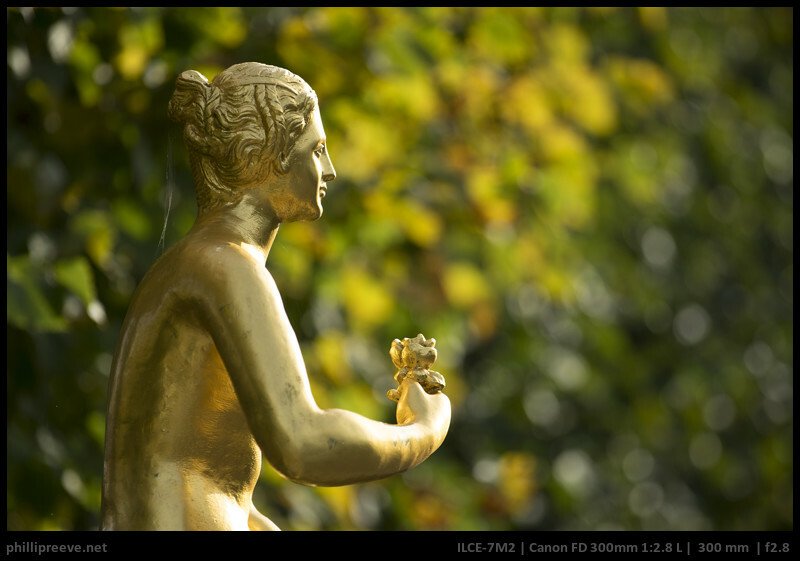 That image from the FD 500 & 1.4x is an example of what it can do. I mainly bought it for astrophoto (deepish sky) mounted on a Star adventurer equatorial mount. However this lens is so heavy that I get pretty close to the max capacity of the mount, and each time I move it to point a sky object I need to reset the polar alignment, which is annoying. 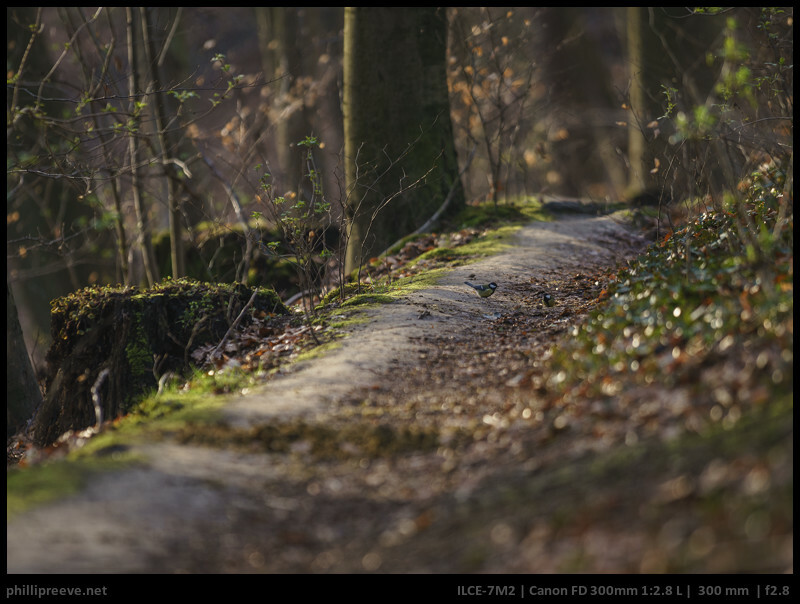 In the end I was a little disappointed by the performance, as even mounted on an APS-C sensor, I need to stop down to F/4 to have half descent corner sharpness. I am surprised that you find it to be very well corrected for CA, on my astro shots I find quite a lot of CA. However astrophoto is quite demanding for a lens, and on the few occasions I have used it in day light, I did not notice CA. I like this lens however for sun or moon rise as I have an FD 2x extender that make it a 600mm for quite cheap. But I am wondering if I should not sell it and get a f/4 L instead. You can find here some defects I gets with 100% crops on each corner of the APS-C sensor. 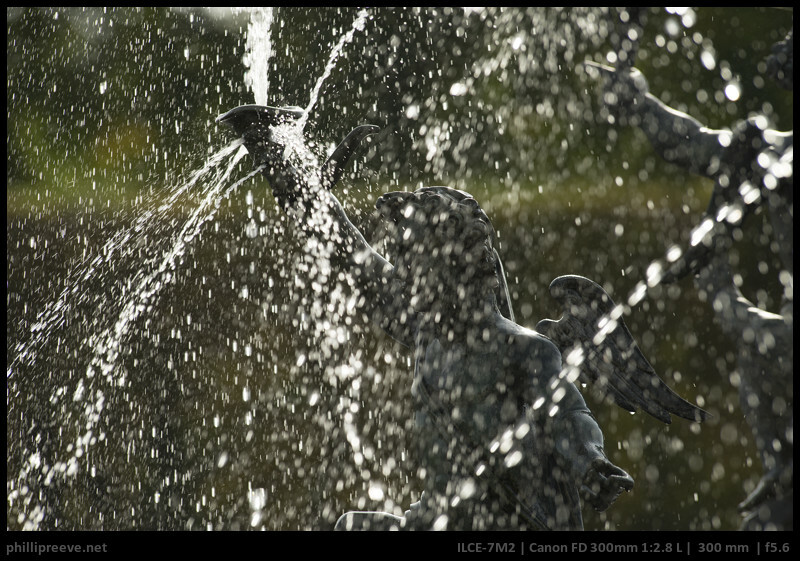 Also some examples of the shots I have done in this Flickr album. I got one of these for $450. Its the most beaten up and rough lens I’ve ever seen. But its amazing and did me proud when i worked in Africa for the last 15 months. Once you get used to using it i managed to use hand held. i used the lens set sideways with the tripod mount resting on top of my left hand for support. Not ideal but works in a rush.